"We want to share our gratitude for the many great teachers and the overall philosophy of learning practiced and taught at OLPH." Our Lady of Perpetual Help School fosters the growth and development of the whole person through an educational program in which children are motivated intellectually, spiritually, physically, emotionally, and socially. Religious education and its formation of responsible young Catholics is the foundation of our parish school. Prayer, worship, behavior, growth in faith, and a commitment to the service of others form the basis of the religion curriculum. Through the example of the staff and the daily experiences of the curriculum, children learn the truths of our faith, study and appreciate Scripture, participate more deeply in parish life, experience a variety of liturgies and prayer services, and respond to the call of service of those in need. 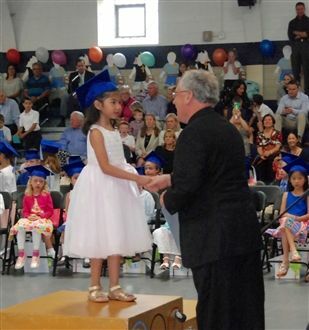 As an academic institution, OLPH School is dedicated to designing an individual program of success for each child. These learning experiences include opportunities to challenge and enrich talents, strategies to compensate for weaknesses, and programs designed to give children the skills to succeed in the 21st century. Additionally through fair, firm, and consistent discipline, children grow in responsible decision-making, self-esteem, and self-respect.